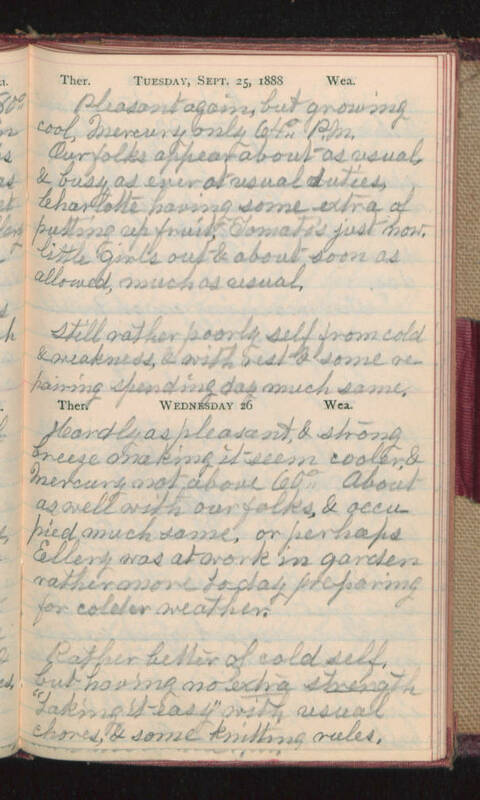 Tuesday, Sept. 25, 1888 Pleasant again, but growing cool, Mercury only 64° P.M. Our folks appear about as usual, & busy as ever at usual duties. Charlotte having some extra of putting up fruit & Tomato's just now. little girls out & about soon as allowed, much as usual. Still rather poorly self from cold & weakness, & with rest & some repairing spending day much same. Wednesday 26 Hardly as pleasant, & strong breeze making it seem cooler, & Mercury not above 60°. About as well with our folks, & occupied much same, or perhaps Ellery was at work in garden rather more today preparing for colder weather. Rather better of cold self, but having no extra strength "taking it easy" with usual chores, & some knitting rules.